Amalou, Thierry et Boris Noguès (dir.) – Les universités dans la ville, XVIe-XVIIIe siècle, Rennes, Presses Universitaires de Rennes, 2013, 252 p.
Snyder, Saskia Coenen – Building a Public Judaism. Synagogues and Jewish Identity in Nineteenth-Century Europe, Cambridge, Harvard University Press, 2013, 350 p.
Amrith, Sunil – Crossing the Bay of Bengal: the Furies of Nature and the Fortunes of Migrants. Cambridge MA: Harvard University Press, 2013. Pp. 353. Bouchard, Gérard (ed.) – National Myths: Constructed Pasts, Contested Presents.London: Routledge, 2013. Pp. 306. Carstairs, Catherine and Nancy Janovicek – Feminist History in Canada: New Essays on Women, Gender, Work and Nation. Vancouver: University of British Columbia Press, 2013. Pp. 290. Charrier, Landry, Karine Rance et Friederike Spitzl-Dupic (dir.) – Circulations et réseaux transnationaux en Europe (XVIIIe-XXe siècles). Acteurs, pratiques, modèles, Berne, Peter Lang, 2013, 228 p.
Chevrier, Marc, Louis-Georges Harvey, Stéphane Kelly et Samuel Trudeau ̶ De la république en Amérique française. Anthologie pédagogique des discours républicains au Québec 1703-1967, Québec, Septentrion, 2013, 529 p.
Confino, Alon – A World without Jews: The Nazi Imagination from Persecution to Genocide. New Haven: Yale University Press, 2014. Pp. 296. Dorroch, Gordon (ed.) – The Dawn of Canada’s Century: Hidden Histories. Montreal & Kingston: McGill-Queen’s University Press, 2014. Pp. 498. Davies, Ross – ‘A Student in Arms’: Donald Hankey and Edwardian Society at War. Ashgate studies in First World War history. Surrey: Ashgate, 2013. Pp. 254. Hermand, Jost – Culture in Dark Times: Nazi Fascism, Inner Emigration, and Exile. Trans. Victoria W. Hill. New York: Beghahn Books, 2013. Pp. 278. Johnson, J.K. – In Duty Bound: Men, Women, and the State in Upper Canada, 1783-1841. Montreal and Kingston: McGill-Queen’s University Press, 2014. Pp. 304. Pelletier, Tommy Simon – Vivre et pêcher dans les Notre-Dame. 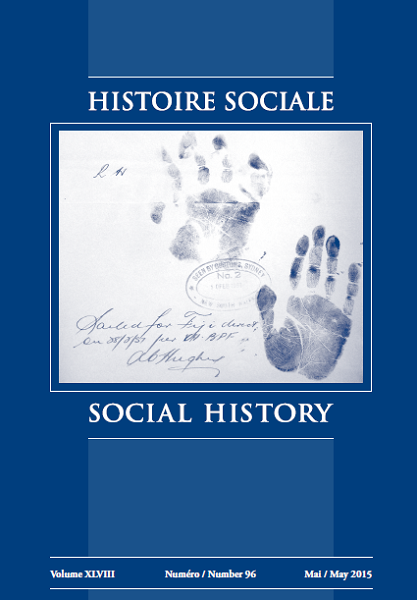 Excursion archéologique sur le barachois de Mont-Louis au Régime français, Québec, Presses de l’Université Laval, 2014, 192 p.
Perrun, Jody – The Patriotic Consensus: Unity, Morale, and the Second World War in Winnipeg. Winnipeg: University of Manitoba Press, 2014. Pp. 292. Phillips, Mark Salber – On Historical Distance. New Haven and London: Yale University Press, 2013. Pp. 293. Robertson, Leslie A. and the Kwagu’ł Gixsam clan – Standing up with Ga’axsta’las: Jane Constance Cook and the Politics of Memory, Church, and Custom. Vancouver: University of British Columbia Press, 2012. Pp. 569. Sanyal, Shukla – Revolutionary Pamphlets, Propaganda and Political Culture in Colonial Bengal. Cambridge: Cambridge University Press, 2014. Pp. 211. Webb, Todd – Transatlantic Methodists: British Wesleyanism and the Formation of an Evangelical Culture in Nineteenth-Century Ontario and Quebec. Montreal & Kingston: McGill-Queen’s University Press, 2013. Pp. 236.